Spearow in game: 7,533 Who? Important notice! Pokemon Spearow is a fictional character of humans. Spearow (Japanese: ????? 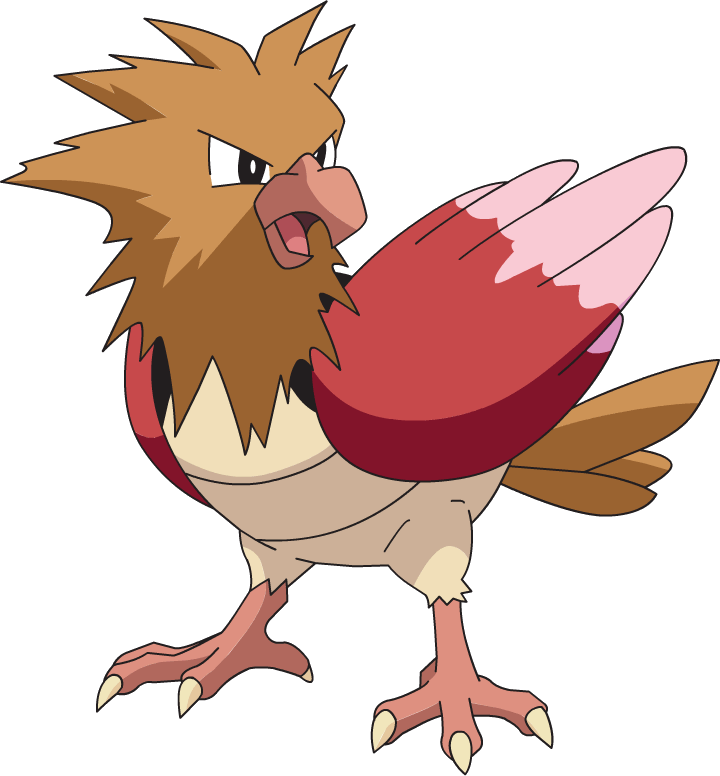 Onisuzume) is a dual-type Normal/Flying Pokémon introduced in Generation I.
Spearow is an avian Pokémon that is very small. It has rough, brown plumage on its head and three brown tail feathers. It has narrow, dark brown eyes with white pupils and a short, hooked beak. The feathers covering its wings are pinkish red with lighter tips, and it has a beige underside with two thin, horizontal stripes. Its light pink feet have two toes in front and one in the back. Black feathers cover its back. Although inept at other aspects of its flying, such as height and distance, Spearow is still capable of flying quickly to protect its territory. However, it must flap its wings at high speeds to stay aloft. Spearow's loud shrieks can be heard over half a mile (one kilometer) away, and are used to warn other of its kind of danger. The anime has shown that Spearow sees in black and white and will chase its foes in a large flock. Spearow is usually found in desolate wastelands and fields, where it hunts for insects. Ash was attacked by a large flock of Spearow in Pokémon - I Choose You! after he hit one Spearow on the head with a rock to weaken it (because Pikachu refused to obey and battle), thinking it was a Pidgey. The flock of Spearow returned with the leader, the very same Spearow that Ash had hit in the first episode, as a Fearow in Pallet Party Panic!. The flock reappeared in flashbacks in Pokémon Emergency!, Challenge of the Samurai, Pikachu's Goodbye, Historical Mystery Tour!, Lucario and the Mystery of Mew and The Fires of a Red-Hot Reunion!. A Trainer that attacked a Lapras had a Spearow in The Lost Lapras. In the same episode, one appeared in a flashback. A Spearow appeared in Mewtwo Strikes Back. A Spearow made an appearance in The Breeding Center Secret. A Spearow was among the Pokémon seen at Professor Oak's Laboratory in Showdown at the Po-ké Corral. A Spearow under the ownership of an unnamed Trainer was treated by Nurse Joy in The Joy of Pokémon. A flock of Spearow appeared in Fighting Flyer with Fire where they attacked Team Rocket. A Spearow was one of the Pokémon stolen by Butch and Cassidy in The Fortune Hunters. Multiple Spearow also appeared in The Power of One, Celebi: Voice of the Forest and Pokémon Heroes: Latios & Latias. Five Spearow appeared in A Better Pill to Swallow as part of Brock's fantasy. Skyler mentioned in The Big Balloon Blow-Up of training multiple Spearow in the past, helping them grow and evolve, but they were never seen during the entire episode. A small flock of Spearow attacked Orville in Fly Me to the Moon. Several Spearow were among the inhabitants of the Dragon Holy Land in Great Bowls of Fire!. A Spearow appeared under the possession of a Coordinator in Hi Ho Silver Wind! Another flock of Spearow appeared in Historical Mystery Tour!, similar to the first episode. A Spearow made a brief appearance under the ownership of a Trainer in the Lily of the Valley Conference in An Old Family Blend!. A Trainer's Spearow appeared in Foggy Pokémon Orienteering! and Battling Into the Hall of Fame!. A Spearow appeared in SM003, as a silhouette. A Trainer's Spearow appeared in SM006. Four Spearow appeared in SM007. 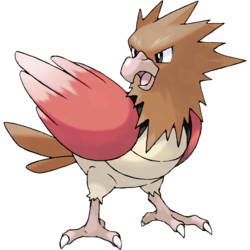 EP001 Spearow Ash's Pokédex Unlike Pidgey, Spearow has a terrible attitude. It is very wild and will sometimes attack other Pokémon and humans. Red caught a Spearow in File 1: Red. He later used it in his Pewter Gym battle against Brock, but it was easily beaten by Brock's Onix. Like in the first episode of the anime, Ash defended his Pikachu from a violent herd of wild Spearow in Pikachu, I See You!. In the manga, he also captures their leader, Fearow. Spearow appeared in Celebi: a Timeless Encounter. Professor Oak had a Spearow in Just a Spearow Carrier. It was powerful enough to take down even a powerful Blastoise with its Mirror Move. In Do do that Doduo Professor Oak used Spearow to battle Yellow to entrust Red's survival with proof of his skill, by ending the battle. It appeared again in Number One Donphan beside Oak while he was talking to Elm via PC. 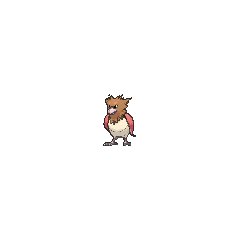 It later evolved into a Fearow prior to the FireRed & LeafGreen chapter. Two Spearow appeared in a flashback in Growing Out of Gengar where they were driven away from its home after the Power Plant had been abandoned. 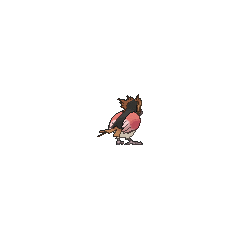 Another Spearow appeared in The Last Battle XIII as one of the Pokémon sent to help the fight in Ilex Forest. 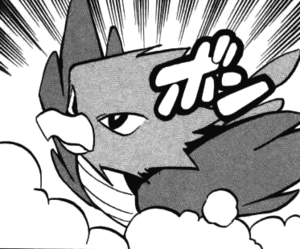 Tomio has a Spearow in the Pokémon Gotta Catch 'Em All manga. One Spearow figure has been released. Its wings are short, so it can't fly a long distance. If it's not eating, it darts around in a hurry. Farmers whose fields are troubled by bug Pokémon appreciate Spearow for its vigorous appetite and look after it. Conductor Room: King of the Sky, Variety Battle: It's Drill Time! Gust Flying Riding the Winds of Change! 51%-100% HP I might be small, but I'm quick! Level up Oh, yeah! Leveled up! Spearow can whip up gusts by busily flapping its small wings. It attacks by whipping up twisters with its wings. Two Spearow that are brother and sister guard the Meadow Zone! Their favorite Attraction is Pelipper's Circle Circuit. For other sprites and images, please see Spearow images on the Bulbagarden Archives. According to the anime episode Pokémon, I Choose You!, Spearow cannot see color. Onisuzume is a combination of ? oni (demon) and ? suzume (sparrow). Cantonese Chinese ?? Guiquè Literally "Ghost bird"
Mandarin Chinese ?? Lièquè Means "Fierce sparrow"